The World Trade Center – Portland, located on the Waterfront in Downtown Portland, Oregon is regarded as one of the city’s architectural icons overlooking the Willamette River and Tom McCall Waterfront Park. Formally named the Willamette Center (for its beautiful view of the Willamette River). The L-shaped complex consists of three buildings with a total of 500,000 square feet linked with extensive pedestrian walkways on the street and elevated bridges above ground level. Architecturally, the crystalline quality of the space framed entry and bridge system was designed to create prism-like patterns over the pedestrian areas and visually de-emphasize the office buildings. Its brilliancy, particularly at night – both from afar and underneath – provide an environment that fulfills the original mixed-use, design. In 1988 the complex became the World Trade Center – Portland. At World Trade Center Portland we make every effort to be the standard in world class building management and operations. We will lead the industry in operations, building improvements, energy efficiency, and sustainability. We will enhance our value to our clients while minimizing risks. We will honor and dignify each person who comes to World Trade Center each day. Sustainability is a primary focus throughout the city of Portland and the World Trade Center Portland has taken and is taking steps to ensure our operational practices are environmentally compatible and provide a healthy work environment for tenants and staff. One way the World Trade Center Portland has taken steps to demonstrate our commitment to sustainability is through the Leadership in Energy and Environmental Design (LEED) certification. We have achieved Gold Level Certification for LEED Existing Building Operations and Maintenance. By committing to these sustainable operational practices and work environments we hope to work towards Global change. With the tremendous sustainability focus in Portland and at the World Trade Center Portland alternative transportation options are readily available for your next visit or your commute! Looking for Parking information? Refer to our Parking Page. Tri-Met Bus Service offers 90 bus lines throughout the Portland Metro area. Within just three blocks of the World Trade Center Portland there are 12 bus stops and 15 different bus lines servicing these stops. Tri-Met’s Light Rail, MAX, also provides many options connecting the Portland Metro area to Downtown Portland. With MAX stops just a few blocks away the World Trade Center is easily accessible from Beaverton, Clackamas, Gresham, Hillsboro, North and Northeast Portland, Milwaukie, and the Portland International Airport. 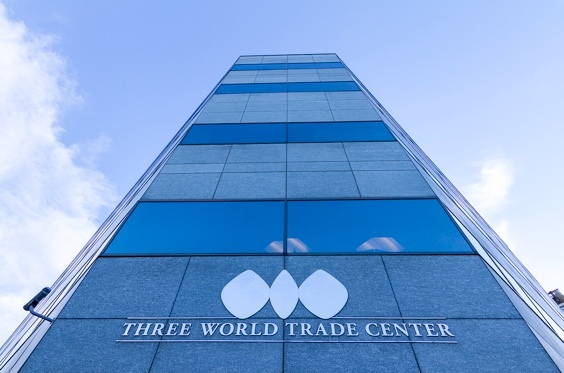 Tri-Met is happy to help you plan your trip to the World Trade Center. The Tri-Met Trip Planner is a very helpful tool in finding the appropriate route for your trip. As Portland is a very bike friendly city there are many bike routes that will find you safely at the World Trade Center. There are Neighborhood Greenways throughout the city in addition to a pedestrian and bike friendly bridge, Tilikum Crossing, located just south of the World Trade Center Portland. You can find out more about bike friendly options by visiting the Portland Bureau of Transportation’s website. The best way to get around Portland is public transportation… This city is known for having one of the easiest and most tourist-friendly public transportation systems in the country, with extensive routes from TriMet buses and light-rail trains. What types of tenants are found in the building? The majority of our tenants are typical office building tenants; law firms, engineering firms, software firms, etc. The three buildings that make up the World Trade Center were built between 1975 and 1978. The buildings were built to be the corporate headquarters of Portland General Electric. Tenants, in addition to PGE, began occupying the main 17 story tower in 1977. THe complex joined the World Trade Centers Association in 1988. The building has staffed, 24-hour security with officers in the lobby plus performing scheduled rounds around the building. The building lobby is open on weekdays from 7am to 6pm. What provisions are there for parking? The World Trade Center has its own dedicated parking garage that is managed by City Center Parking. Street parking in the area is metered by the City of Portland. Refer to our Parking page for more parking information. Is World Trade Center convenient to mass transit? The World Trade Center is located at the heart of the Portland area transit system. TriMet light rail stations are located a few short for blocks away and convenient bus routes pass through the immediate area. For more about public transit Downtown, see www.trimet.org. How is the building managed? The World Trade center is managed by World Trade Center Properties. We are responsible for the day-to-day operation of the building and tenant relations. We arrange Interior and exterior building maintenance, Janitorial and Security services. The World Trade Center is located in Downtown Portland. Our area features a host of amenities: Pioneer Square, Waterfront Park, museums, post offices, restaurants, and all sorts of shopping and services. For more information on Downtown, see the web site for the https://www.travelportland.com/collection/downtown/. Questions about the Conference Center and Events?